The East Midwood Jewish Center Sisterhood and Men’s Club are communities within the community, enriching the cultural, religious and financial life of the center. 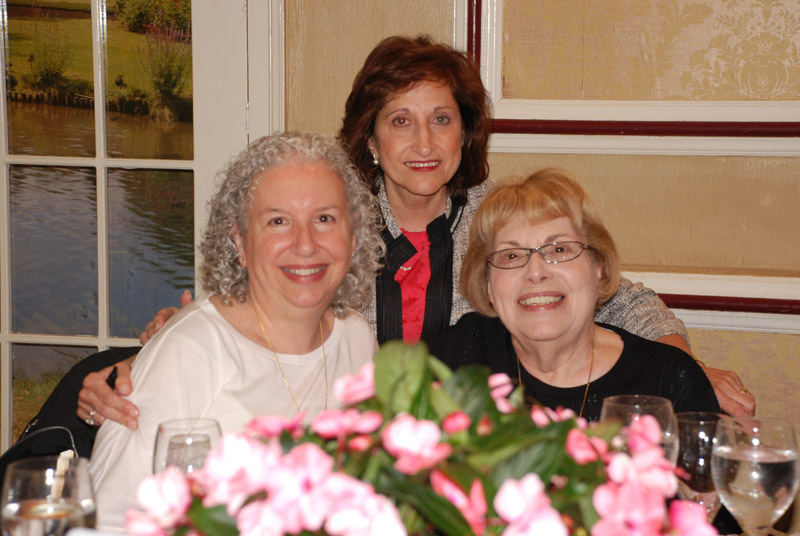 Sisterhood: Rochelle Eckstein, Amy Nitzky and Shereen Rosenthal, presidents. 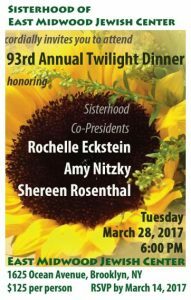 It is our pleasure to announce that our Annual Twilight Dinner will be held on Tuesday, March 28, 2017 at 6:00 pm. We will be honoring Rochelle Eckstein, Amy Nitzky and Shereen Rosenthal for their dedication and many contributions to our community. This is Sisterhood’s largest fundraiser of the year. We will be holding our annual raffle that night. Raffle tickets will be sold at the dinner and not available in advance. We ask that you show your support for Rochelle, Amy, Shereen and the East Midwood Jewish Center by attending our dinner and placing ads in the journal. Your participation will ensure the success of our 93rd Twilight Dinner!